Patients are jumping at the opportunity to finally get the straight teeth they always wished they had without the trauma and hassle of traditional braces. ClearCorrect clear braces for adults can help you create your dream smile with most people not even noticing you are wearing braces! Prestige Dentistry has helped MANY patients throughout the Palm Harbor and Trinity area get straight teeth through the use of the remarkable ClearCorrect clear braces for adults treatment. Straight teeth are highly valued in today’s world. Traditional metal braces may have deterred you from creating a beautiful smile with straight teeth in the past, but ClearCorrect clear braces for adults solves many of the issues that may have prevented you from receiving orthodontic treatment. COMFORTABLE | Many with traditional metal braces routinely suffer mouth sores and even injuries from the brackets used in metal braces. 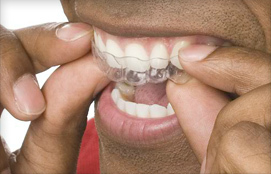 ClearCorrect clear braces for adults are designed for YOU and molded to fit snugly, without pain, over the surface of your teeth. EAT WHAT YOU LIKE | You won’t have to worry about the difficulties of having a limited diet and eating with discomfort. With ClearCorrect you can enjoy the food you love because the clear braces are removed before eating. This gives you maximum levels of flexibility and ease that is not found with traditional metal braces. HEALTHIER | ClearCorrect is beneficial to oral hygiene. Traditional braces make it very difficult to maintain proper levels of oral hygiene, as they are difficult to brush, and flossing can feel like an impossible chore. Unfortunately, this opens the door to tooth discoloration and decay. However, removed prior to brushing and flossing, ClearCorrect allows you to maintain optimal levels of oral hygiene. At Prestige Dentistry in Palm Harbor and Trinity, we invest in the technology that will improve your smile the most while allowing you maximum ease and comfort. Our concern for our patients makes them feel relaxed and confident when coming to see us. Feel free to email us or call us today to make an appointment or to learn more ways in which ClearCorrect braces for adults can benefit you – including getting those straight teeth you want! We happily serve patients all over the Palm Harbor area, including East Lake!